Veneers are finely sculptured shells which are bonded to the front of the tooth to change their colour or shape, make them look straighter, minimise gaps or lengthen them if they are short or chipped. Dental veneers can help create beautiful, flawless smiles. Porcelain Veneers can help improve the colour and shape of your teeth and help it to return to its natural appearance. Porcelain Veneers can also be used to fix chipped teeth as they are able to cover the front tooth thus replacing the chipped area. Many people have gaps in between their teeth, porcelain veneers are able to seal small gaps and help align teeth returning them to their correct placement, resulting in a straighter smile. Anyone who suffers from dental issues such as discoloured, chipped or crooked teeth, can enjoy incredible results with porcelain veneers. By adding a thin layer of porcelain to the tooth, the appearance of the tooth can be significantly improved, as only minimal tooth preparation is required. They can also last a long time, if well looked after they can last from 10-15 years. 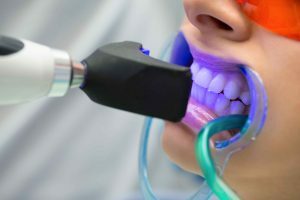 Tooth bonding involves tooth coloured composite material that best matches the patients' teeth, being bonded to the teeth to improve either their colour and/or shape. They can be also done in a way to make teeth look straighter without orthodontics. Like hair and skin, teeth can vary in colour. Some are darker or more yellow than others, even when they are healthy. Teeth can become darker as people age and also with the consumption of staining substances like tobacco, red wine, tea, coffee etc. Teeth whitening is one of the least expensive and least invasive ways of enhancing your smile. There a few options that you can choose from to achieve a new brighter smile, including an take home whitening kit tailor made for you or an intensive ‘in chair’ light activated teeth whitening treatment using patented technology that whitening your teeth instantly. Whitening is a process where the tooth discolouration is ‘whitened’ to a lighter shade. Through chemical means It removes the staining agent. Results depend on the severity of the discolouration. 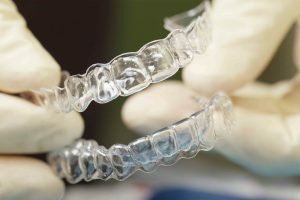 At Rye Family Dental Care we use SmileTru, a brand of removable clear, almost invisible plastic sleeves, that fit the your teeth to gently guide them from their current, to their desired position. They can be removed for eating and cleaning and are very comfortable to wear. In some cases, they are quicker than a normal course of braces and is a great alternative when patients want to avoid brackets and wires. Consultation is required to see if the patient is a suitable candidate. Porcelain crowns are custom-made protective porcelain caps that are cemented over heavily filled teeth, to protect them from breaking . It can make teeth look whiter, improve the shape, close small gaps, and make them look straighter without orthodontics. Multiple crowns can be used to create a bridge, which is a fixed prostheses that can replace missing teeth. Contact us today and book an appointment to discuss your eligibility for any cosmetic procedures and we'll addressed any concerns you have about any procedures.